Stock photo of Woman dressed in medieval guard clothing during the medieval markets on the grounds of Burg Ronneburg (Burgmuseum), Ronneburg Castle, Ronneburg, Hessen, Germany, Europe. Woman dressed in medieval guard clothing during the medieval markets on grounds of Burg Ronneburg. This stock photo shows a woman dressed in medieval guard clothing during the medieval markets on the grounds of Burg Ronneburg (Burgmuseum), Ronneburg Castle, Ronneburg, Hessen, Germany, Europe. 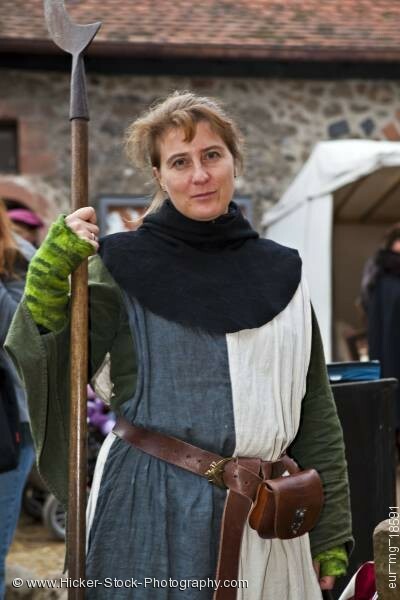 At the medieval markets of the Burg Ronneburg, a woman is wearing the clothing of a medieval guard. Her long tunic is half gray and the other half is white. A large leather belt hangs around her waist with a small leather case attached to the belt. She wears a black covering that is around her neck and down her shoulders. She carries in her hand a weapon in her hand. The weapon has a long handle with a metal attached at the top. An old stone and mortar building sits behind the woman. Woman dressed in medieval guard clothing during the medieval markets on the grounds of Burg Ronneburg (Burgmuseum), Ronneburg Castle, Ronneburg, Hessen, Germany, Europe.